When I first started my blog I had no clue of the direction it would take, I knew that the heart of it would always be about my love of creating things but other than that I have just gone with it. Sometimes I love my posts sometimes not so much but I figure unless you give something a try how will you ever know the outcome...Blogging has also brought some much needed balance to my life, I don't love my day job (but don't hate it either) and whilst this week my real life job has brought me down my virtual life has brought me nothing but joy, connecting with others is definitely one the unexpected pleasures of writing a blog. Charlotte this has made my whole moth. I love your heart-felt explanation for how you got into blogging (totally same as me) and your kind words about Randomly Happy. That is pretty. I wonder though, does the lace hold the jewels well? Hi Stefanie. The lace I choose was quite sturdy and I hand stitched the jewels so they are pretty secure. I will hand wash to be on the safe side. I have put a link to the lace I brought on Elena's blog. 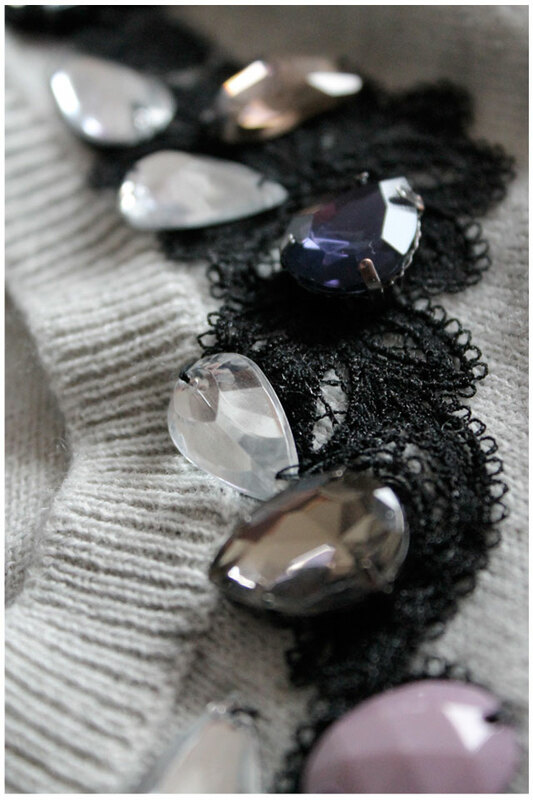 This is a gorgeous cardigan! I love the combination of black lace and jewels...so elegant! Thank you for sharing!